“Between the Street and the Sky” describes itself as a “provocation for Melbourne” rather than an exhibition about urban planning. It is at the City Gallery in Melbourne Town Hall. The elegant little display is certainly provocative in putting the gigantic growth of central Melbourne into perspective. More people are living in tall buildings with an ever smaller footprint. However, increases in population have not been met with an equivalent investment by either the city council or businesses. Planning is currently a hot topic in Melbourne, maybe in the rest of Australia too. This is because the quality of planning in Australia is catastrophic. Consider another example not covered in the “Between the Street and the Sky” exhibition. A major tourist attraction damaged for the benefit of a short term commercial interest. It could be the impact of the Culture Kings shop on Hosier Lane, it could be the Apple store in Federation Square or Adani coal mine in Queensland potential to destroy the Great Barrier Reef. Take your pick they are all examples of Australia’s lack of planning. It is not just tourism that is threatened but the environment, to culture, to being able to live a good life. Rather than focusing on one issue I want to know why Australians repeatedly makes these kind of decisions. I will not be blaming one political party for it because that is simply false and the people who do that are part of the problem, as they are trying to get a short term political advantage while damaging Australia in the long term through entrenched partisanship. I am happy acknowledge that this kind of decision making is not unique to Australia if the Australian demanding this will acknowledge that Australia is amongst the best in the world at doing irreparable damage to its own long term interests. It is a problem of poor planning, avoiding planning and not planning. It is as if many people living in Australia never intended for Australia to be a permanent residence. Even if they never did, most of Australia’s population arrived planning to exploit the natural resources, become rich and return to their home country. This is especially true of the British colonial immigrants who became Australia’s ruling class. Australians often don’t want any other people in the area because this would additional people who will just reduce the amount that they can exploit. This paranoid and greedy reaction to the limited resources drives both Australia’s abuse of refugees and a local defence of the status quo in suburban infrastructure and planning. Instead of avoiding the difficult issues Australia needs plans. Unlike what many sculptures become by accident, Habitat Filter is intended to become a bird roost. The green, blue and orange shards fit into Melbourne’s contemporary architecture on the skyline. Eight shards stand in the middle of a freeway off ramp. In some areas there would be no need for the extravagance of such a construction but the highly visible location near ACCA and the Malthouse Theatre requires more than just a generic design solution. Habitat Filter comes with many environmentally friendly design solutions: a vertical garden creating an urban forest island and providing natural filtration of water and air by native species vegetation. It makes use of recycled materials and provides renewable energy, through photovoltaic cells, to offset the energy for its lighting. I hope that the vegetation has grown more over the year since I took these photographs shortly after it opened in 2016. It is part of CityLink’s sculpture collection; see my earlier post for more on freeway art. It is an attempt to restore a small circle of degraded inner city land designed by Drysdale, Myers and Dow. I use the word ‘designed’ because that is what is used on the sculpture’s information panel and to emphasise the background of the designers. Matt Drysdale is an ‘urban designer’ and both Matt Myers and Tim Dow studied architecture. The large letters spelling out its name is just prosaic; it eliminates the mystery of art, reducing it to a branded design solution. For more on the subject of sculpture vs architecture. I can understand why the chainlink fence is essential and yet it is not part of the design plan but rather added as an undesigned after thought. However, neither the sign nor the chainlink fence is not going to put the birds off roosting. Perhaps my pedestrian perspective on it is wrong; perhaps I should be travelling in a car to see it at speed rather than stationary. Or maybe, as Habitat Filter is a human free zone, I should ask the birds. I tried but various species of parrots argued amongst themselves, the crows commented dryly and the magpies just attacked me. I have been looking at all the ornamentation on Victorian buildings. The keystones with heads, the corbels scroll brackets, the flower shaped patraes and the plethora of other embellishments, like over decorated wedding cakes, on nineteenth century buildings. Now in the twenty-first century they are in varying states of repair, some crumbling away. I am amazed that I haven’t heard about some concrete pineapple or other orb becoming dislodged and crashing onto a roof. Do have a metal armature supporting them? There is so much about these ornaments that I don’t know. Given that I see these ornaments every day I am struggling to even to learn the vocabulary to describe them. They are so alien after the modernist world. 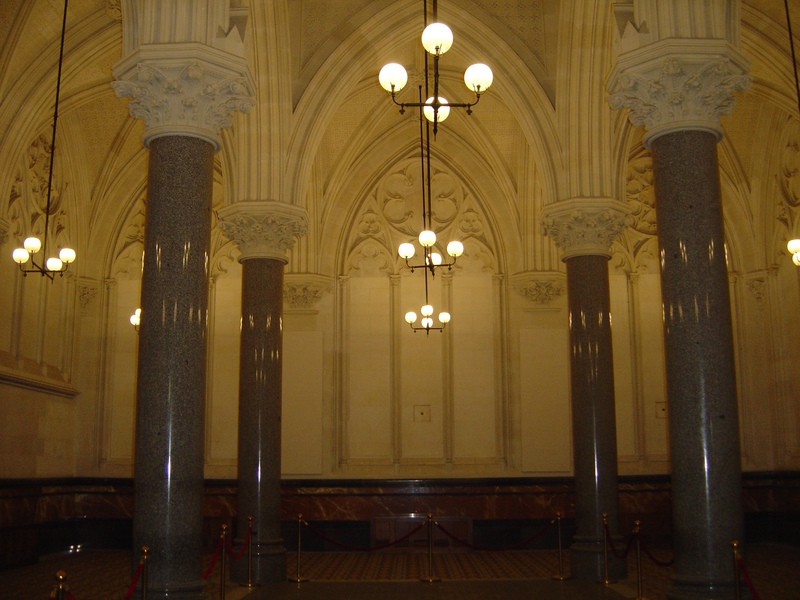 Where John Ruskin might have endorsed ornamentation, the architect Alfred Loos declared decoration a crime. Some of these architectural ornaments were made by Colin Young Wardrop, who also taught modelling and woodcarving at Geelong College, and William C. Scurry. Both men were on the council of the Yarra Sculptors’ Society. 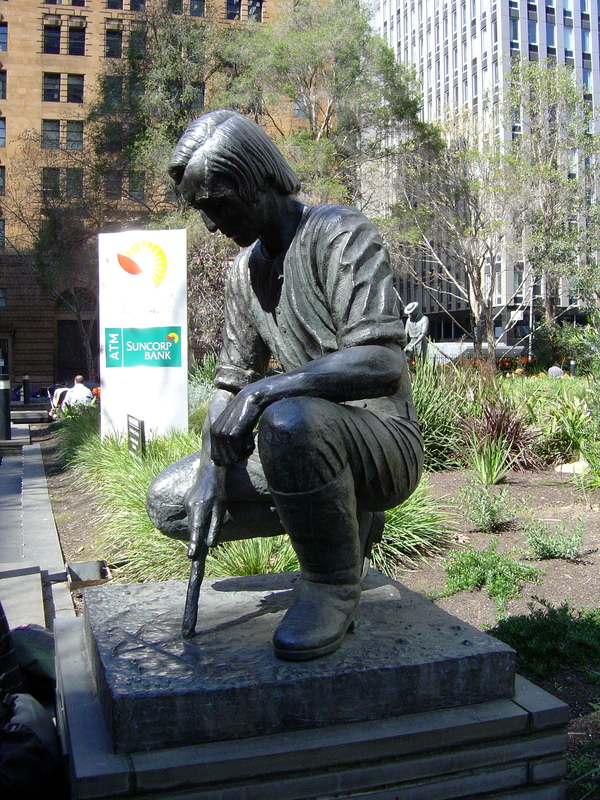 Ken Scarlett’s Australian Sculptors has details on William C. Scurry. It is uncertain when William Scurry’s father arrived in Melbourne but what is know is that in 1856 Scurry’s uncle, James Scurry was working with Charles Summers and John Simpson MacKennal. 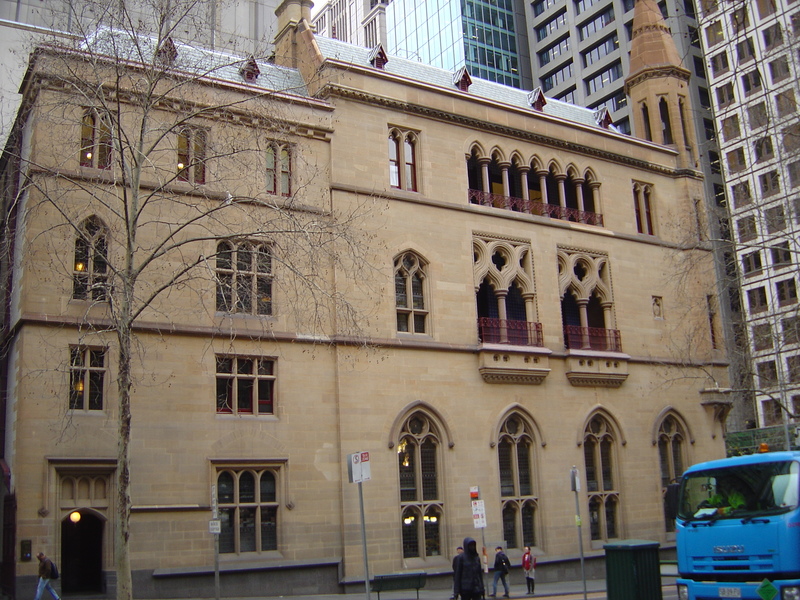 James Scurry was producing decorations for the interior of Parliament House on Spring Street including the two figures, Mercy and Justice, on the north side of the Legislative Council Chamber. Charles Summers went to create the Burke and Will Monument. John Simpson MacKennal was the father of Sir Bertram Mackennal, who became Australia’s first international superstar artist. The buildings in the centre of Melbourne are both familiar and unknown, they seem to change around like something out of the movie, Dark City. Exploring the city has to be a regular activity as there are changes occurring all of the time and a once familiar area transforms. The city as a creation, as a great co-operative work of architecture, art and engineering stretching over a vast area and reaching into the sky, a larger concept than a medieval cathedral. The creation, curation and alteration of which is a mix of planning, adapting and neglect. The city draws you along its streets, wanting to see what is coming around the corner. Each street creates a new scene, one block is totally different from the next. Underneath the city, the ground level is as constructed on foundations. How deep does it go? The labyrinthine network of tunnels, the subway, the subconscious of all cities. There is a mystery beneath all cities, the mystery of the labyrinth and at its core the Minotaur. Too much repetition in a city reminds one that it is also a labyrinth where a Minotaur hunts for sacrificial victims. “Bloody tribute!” says Theseus after tagging the wall with an outline of his hand sprayed by mouth in red ochre, or is it bull’s blood? Cities are visually dense; signs and symbols compete for our attention. The accretion of images, of advertising and signs. The many shiny surfaces reflect the many lights further confusing the vision. The visual density of the city has presented a challenge to visual artists for the last two centuries. Graffiti and street art rise to this challenge by imitating the visual intensity of the city, by being part of and by being framed by the infrastructure of the city. Graffiti tries to fit into this environment by becoming a tag, a personal logo in a world full of corporate logos. Both the graffiti writer and the street artist rectifies the urban environment by adding their designs to the layers of images, personalising the alien, impersonal architecture of the city. The whole of Melbourne could be seen as an un-curated art gallery for graffiti and street art. Except that there are small semi-curated zones, like… roll the credits… Doyle’s Blender Alley and Lovelands, the area of Fitzroy curated by Shaun Hossack of Juddy Roller, Dean Sunshine’s factories in Brunswick. Gordon Harrison, the City of Melbourne engineer should also get some credit of street art in the CBD. I’m sorry if I have missed anyone. The suburban zombie might look like ordinary people but they lack a life. Suburban zombies are often employed; zombies make good workers for menial labour, but they are not living their own life. How to live your own life is the most important cultural questions of all time. Not to be confused with how to live a life, or the life that others want you to live. Others might value your life for their own reasons – some just want to eat your brain. The classic post-war consumer dream was sold to millions of zombies: a TV, a car and a house in the suburbs. The payments for this borrowed dream go on for ever. Life in the suburbs is a commercial product and fear is good for business. The suburb continues to sell as a product and it’s nervous. Are the suburbs really full of transitory inhabitants watching the house prices, always ready to sell up and move on if the price is right or if the zombie horde descends on the area? This mix of home life and commerce contributes to fear and further alienates the suburbanite from their home. Even cars are kept largely impersonal to maintain the best resale value. Examples of suburban paranoia are common. The secrets keep building up in the suburbs, they are so discreet and genteel. Your neighbour might be judging you as criminal, alien or anathema. The paranoia, the susceptibility to fear mongering that such suburbs create. It appears idyllic except that the suburban mentality is paranoid. Isolated in the suburbia, living next to unknown neighbours, fear is an understandable response. Suburbia was designed to create a homogeneous, assimilated population. The soporific repetition of suburban landscapes creates an unnerving sense of déjà vu. Here and there are the odd flourishes in suburban architecture, gardens or decoration. Small triumphs against conformity or simply demonstrations of eccentricity? There is an absence of any real landmarks or even hubs in the suburb, means that there is no logical place to rally the population against the ravenous zombie hoards. Transportation designed on a circulatory system of capillary roads feeding into arteries view hubs as undesirable points of congestion. Place where several paths intersect are designed to have no holding qualities. The only place in the suburb that has any holding power is the home. It is there that the population intends to bunker down. Fear of the zombie hordes have driven people to retreat to fortified zones at the back of their houses only venturing out to their front yards for the daily commute. Design responds to both the realities of life and the unrealities of desires. The mass experience of suburban life tried to create a middle ground between the inner city, cosmopolitan life and the country life for the middle class. The suburbs are a reactionary location, rejecting the urban environment rather than trying to improve it. The problem with suburbs is not simply a question of design any more than it is a choice of what weapons to use in the zombie apocalypse. It is a problem of how to live and it will require both changes in the mind set of the population and bricks, concrete and steel of the city. There is constant redevelopment in the CBD, buildings are being torn down and new buildings built, but two redevelopments have caught my attention because of the public sculptures caught up in these developments. 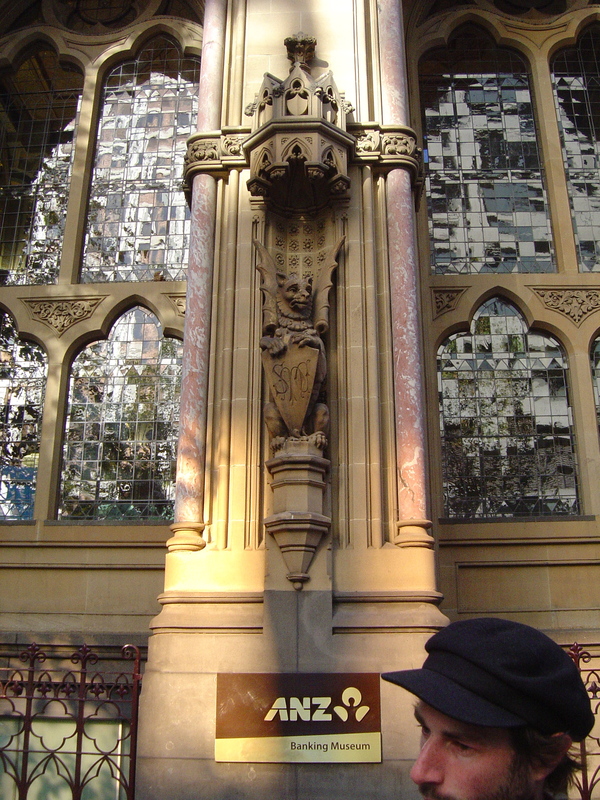 Although these sculptures are public, in that they are on premises open to the public, they are privately owned. These are the redevelopment at the 360 Collins Street and 447 Collins Street. My interest in 360 Collins Street is focused on the forecourt area on Little Collins Street where there are several sculptures by Peter Blizzard’s Shrine to the Ancient River, Paul Blizzard’s Fossil Stones and Chris Booth’s Strata. See my blog post. In 2011 there was a proposal approved for 15-storey development in the forecourt area whereas the present 2015 proposal retains, refurbishes and redevelops part of the forecourt area. For more on the development see Urban Melbourne. Ironically it was a dislodged slab of its marble facade in 2012 that spelt the end for the National Mutual building at 447 Collins Street designed by architects Godfrey, Spowers, Hughes, Mewton & Lobb in 1965. It’s façade of marble slabs was its one notable architectural feature, a move away from the curtain wall of earlier modernism. 447 Collins Street is now vacant and approved for demolition. In the forecourt of 447 Collins Street are the statues of John Batman by Stanley Hammond and John Pascoe Fawkner by Michael Mezaros, see my blog post. What will happen to the sculptures? The Moral Rights provisions in the Copyright Act in 2000, under section 195AT, the owner of a moveable artistic work is liable to the artist if they destroy the artistic work without first giving the artist opportunity to remove it. The artist or their heirs, as two of the sculptors are now deceased, have the right to be informed about the removal, storage or subsequent reinstallation. 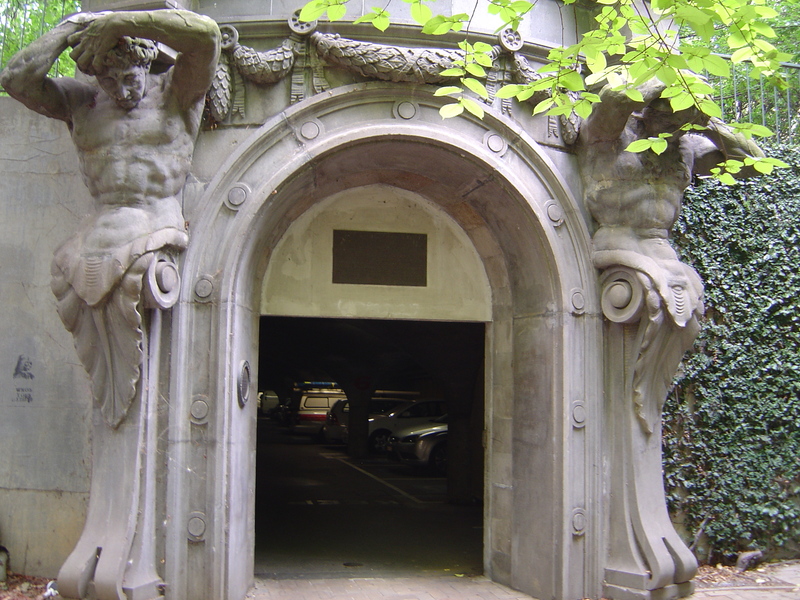 In the past Melbourne University was eager to provide new homes to sculptures dislodged from their original locations in the city, see my blog post. 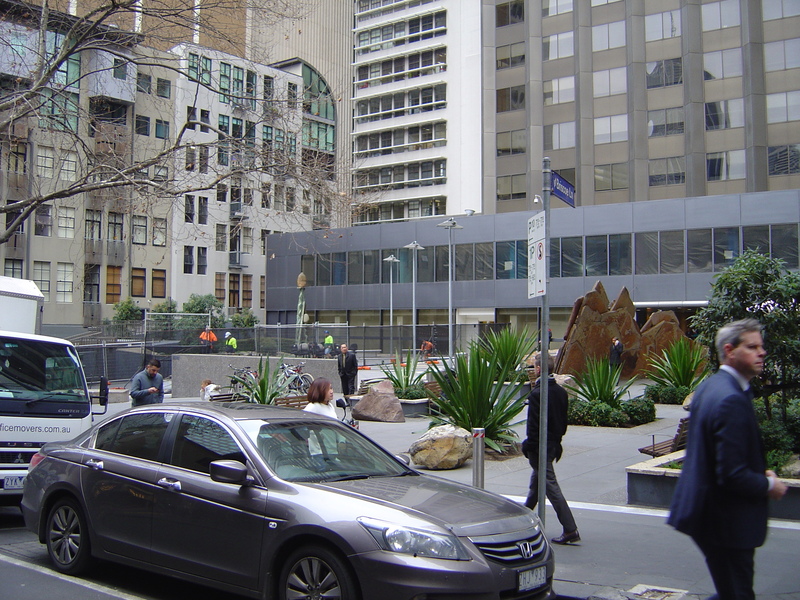 None of the sculptures at either 360 Collins Street or 447 Collins Street are site specific so it should not proved difficult to find a new home for them, if they are not returned to refurbished forecourts at their present locations.